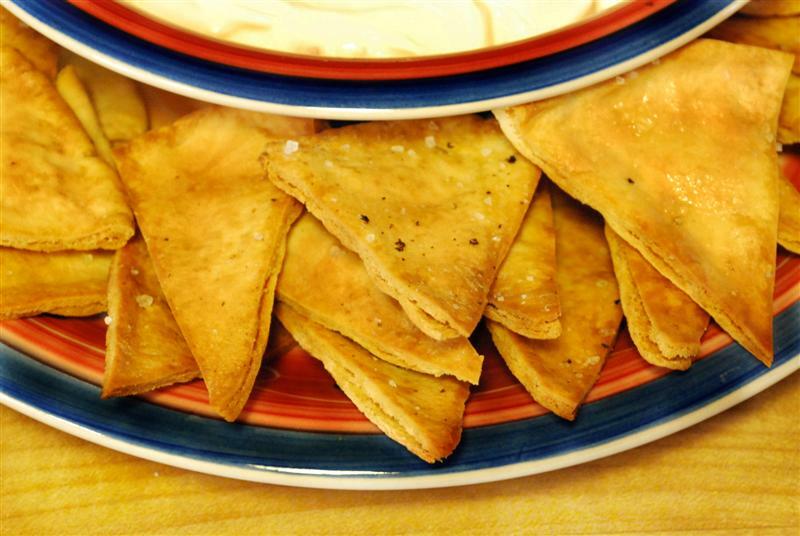 My last post featured Mast-o-musir, and if you look at the picture you will notice that I serve mine with pita chips. Because I was ever so ambitious that day, believe it or not by the end of the day I had four different recipes for posting, I decided to experiment with pita chips making, which is something that I had never done before. I love pita bread. When you step into any Persian Market you will notice that there are a variety of brands and sizes of pita breads. I especially love pita bread when it is fresh and very soft. I have to tell you all a little secret, I was introduced to pita bread when I moved to the US. You wonder why? Because Pita is originally Arabic and I had never seen it in Iran back in the days. I can’t begin to tell you how fascinated and blown away I was the first time I had a pita chip. I was immediately a fan! You should know that I am chipsaholic. I love chips, they make me happy, period. Now that I told you one of my deepest secrets, let’s get back to the scope of this post. I have been thinking about experimenting on my own with the homemade type. I found that for me it is the best thing to do with left over bread that is no longer soft. It is super easy to make as you will see below. This recipe make 24 wedges of pita chips. Preheat your oven to 370 degrees. Place your pita slices on a cutting board. Cut each round into quarters. Then cut the quarters in half. You may be very detail oriented, and perhaps thrive to make sure that all of your slices are the same exact size. Me? Nop, as you can see above, mine vary in size, some are skinnier than others!!!! Place the slices on a baking sheet lined with aluminum foil. That’s how clever/lazy people do things, so that they don’t have to wash the baking sheet afterwards! That’s how I roll, folks! Pour some olive oil into a small bowl. Brush the top of each pita with olive oil. Grind some sea salt on top of each slice. You can use Kosher salt, but please, please, please, don’t use regular salt. It makes such a huge difference to use fancy salt! Next step is to grind some pepper on the slices. Then put them in the oven and bake them for 15 minutes. Once they come out, they should look like this! YUM! I really love your tutorials. Would you ever consider offering local cooking classes? Thank you for your kind comment. I have actually thought about it, fantasized about it, and dreamt about. But soon realized that our kitchen is super small and not fit to do any type of group cooking that involves more than two people. About a year ago a girlfriend offered her kitchen to teach authentic Italian dishes but we never did any serious planning. But then again I don’t know how I would find people locally who would be interested. If you ever do find anyone who is interested in hosting a class-type situation, let me know! My family is Persian, but I don’t cook a whole lot of Persian food, which is why I’m interested in learning how to do so! I promise you will be the first one to know! How about opening a restaurant? If you do those cooking classes, I want to know too! I read that article the day it came out. I love it and thought that it well advocated for the deliciousness of Persian food. I have been to Attari and it is really good and always crowded. I am not a fan of Flame, the food presentation is nice, but lacks good taste. In Westwood Shaherzad is by far the best with their own bread which is baked in the break oven in the dining room. Mashti Malone rocks. Period. No restaurant opening for me. I worked in a restaurant for a summer four years ago, and quit and went to grad school! Late to the pita chip party here, but if you ever try deep frying them, they are quite delicious that way as well. I’ll post a recipe on my blog at some point. Like you, I do a baked version for health considerations and ease of cleanup. I can only imagine how good they can be, but honestly, I don’t even want to take it to the “frying bed” level!!! Hi. Have to tell you I accidently visited your site and then decided to try a few of your recepies and its been a real hit with the crowd. My Q is can I make the pita chip a day before the party day. And I made your festive salad. Everyone loved it. But pom is not in season now and I want to make it again. What can I substitute it with. I was thinking strawberries. What do you think? Looking forward to your response. Shawna, yes, you can make the chips a day in advance. If you have a trader joe’s close to you, you can substitute with dried sour cherries or even cranberries! I tried this chips. They were healthy and so easy to make. Everybody liked it.